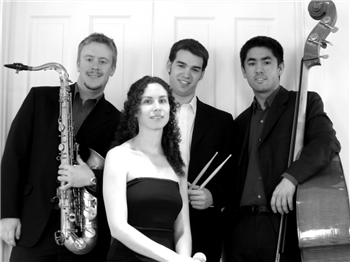 Share The Back Bay Quartet's EPK! Jazz vocalist Tammy Scheffer’s strong improvisation skills, light soprano voice and wide range of vocal abilities have gained her appreciation from fellow musicians and audiences alike. Before moving to Boston, Ms. Scheffer was an active member of the jazz scene in Israel. She has performed repeatedly in premier jazz clubs in Jerusalem and Tel Aviv, and was a featured vocalist in the Israel National Jazz Festival. Ms. Scheffer attends the New England Conservatory and studies with Jerry Bergonzi and Dominique Eade. “Tucker Antell is from another planet!” were the words of 92 year-old veteran saxophonist Al Galladoro after recording with Antell, then only 16 years old. Antell was a featured soloist at the International Association for Jazz Education Convention in New York, sharing the stage with saxophonist Dave Liebman. His “prodigious technical and improvisational skills” and his energetic playing have been appreciated by audiences throughout the country. Mr. Antell currently studies at the New England Conservatory with Jerry Bergonzi and George Garzone. Kai Ando is an active bass player in Boston and New York City. Select performances have included Connie Francis, Joan Rivers, Jimmy Heath, John Hendricks, Monterey Jazz Festival, JVC Jazz Festival, Harlem Jazz Festival and Carnival Cruise Lines. In 2007 Kai toured China with the New England Philharmonic under Benjamin Zander. Kai recently graduated from the New England Conservatory where he studied with Danilo Perez, Jerry Bergonzi, Frank Carlberg and Don Palma. Well versed in many styles, Alex Chaloff (Drums) feels equally at home in a jazz club, orchestra pit or concert hall. He has performed around the world at such venues as Carnegie Hall, Boston’s Symphony Hall, St. Giles' Cathedral in Edinburgh, the Acton Jazz Café, the Boston House of Blues and the American Repertory Theater. He is currently pursuing his degree in Jazz Performance at the New England Conservatory of Music, where he studies with Billy Hart and Bob Moses.